For it brought her a splendid crown. On the twenty-first lovely Juliana was beheaded. To the Five Hundred Martyrs. To the One Hundred and Thirty Female Martyrs. 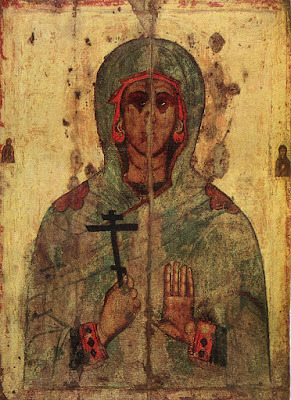 Together with three times ten female Martyrs. She lived during the reign of Emperor Maximian (286-305), was from Nicomedia, the daughter of wealthy parents, by whom she was engaged to a senator, whose name was Eleusios. Because Eleusios wanted to get married, the Saint accepted, but said to him: "When you become an eparch, then let the marriage take place." When he became an eparch, the Saint said to him: "If you do not abandon the religion of the idols, and if you do not convert to the faith of Christ, know that I will not accept to enter into the communion of marriage with you." Eleusios then went and told all these words of the virgin to her father. Because her father was unable to change her from her faith in Christ, he handed the Saint over to her fiance and eparch, to condemn her as he wished. The eparch therefore took her and stripped her of her clothes, and ordered sixteen soldiers to scourge her body with raw hides. They then suspended her by her hair, so that the skin from her head was scalped to the bone. Then her sides were burned with fiery irons, and she was cast into the fire. After this a fiery iron bar was passed through her thighs, and binding her arms to her side, she was cast into prison. While the Saint was in prison and praying, the enemy of all and hostile devil appeared in the form of an Angel, in order to persuade her to sacrifice to the idols, and be freed from torments. 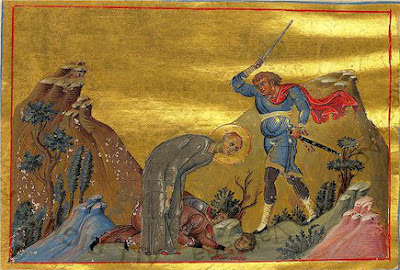 The Saint rejected him, and made him against his will to confess that he was the devil. The blessed one was again brought before the eparch, and because she remained unalterable in her faith and love for Christ, she was placed in a burning furnace. 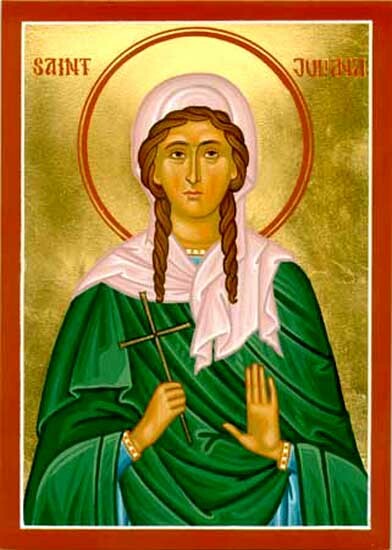 By divine grace she was kept unharmed until the furnace extinguished, making five hundred men believe in Christ, who together with a hundred and thirty women were immediately beheaded. Later the blessed one was placed in a fiery cauldron, which to her became a bath, but to unbelievers it was a cause of destruction, for the bronze fastener of the cauldron unfastened as if by some agent, and destroyed those Greeks who stood around. 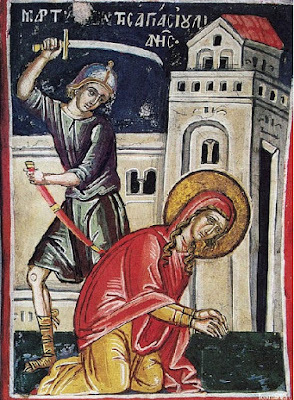 Lastly, because the Saint was above all the torments, she was beheaded. In this way the renowned one received the crown of martyrdom. She was sixteen years old when she was engaged to Eleusios, and she was wedded to Christ when she was eighteen. Her Synaxis is celebrated in her martyric Temple next to that of Saint Euphemia in the Petrion district [of Constantinople]. All-blameless bride and venerable trophy-bearer, thou art wedded to the Word of the Immortal Father, O glorious Juliana; for having wisely disdained thy mortal bridegroom, thou didst strive beyond nature to destroy the serpent. And now thou dost delight in the joys of thy Bridegroom. Thou wast a comely virgin, and a martyr wounded by divine love. Thou wast taken up to the heavenly bridal chamber, where thou dost pray for those who honour thee.